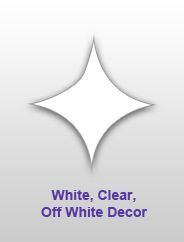 White, Clear, Crystal, Cream & Off-White Home Decor and Accessories! To Decorate your home, special event or production set with white, clear, cream and in-between colors, just shop at ShopWildThings. Browse our unmatched inventory of white, ivory, cream, clear and sparking crystal Decor . We have stunning beaded curtains, lamps, canopies, chandeliers, lighting strands, furniture and luxury-look and natural Decorative fabrics. For walls, windows and backdrops, shop our crystal beaded curtains with the sparkle of diamonds. We have ceiling drapes laced with LED lights, gemstone and soft white pearl beaded curtains and brilliant crystal columns. Our gorgeous faux Capiz shell beaded curtains were featured in the movie "Dreamgirls." We're the go-to favorites of Hollywood set designers and special event planners.